Designed as an attraction, this 107 metre high 'mast' consists of a concrete shaft 9 metres in diameter with a ship's bridge at 30 metres and a crow's-nest at 100 metres. The dynamically designed crow's-nest comprises an amphitheatre-shaped restaurant cantilevering a maximum of 12 metres. This steel structure was first welded, then faced and finally hoisted into position. 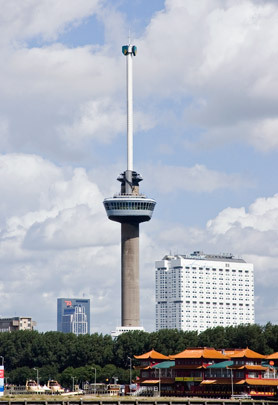 In 1970 when the Euromast lost its record height to the Medical Faculty, a slender steel shaft, the Space Tower, was added, up which a ring-shaped cabin circles to a height of 176 metres.